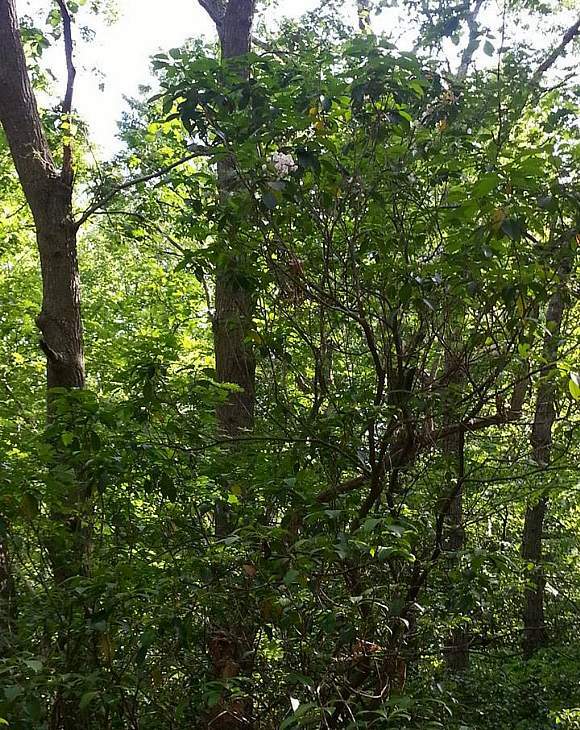 A shrub which is said to grow to 1m, but can grow much higher, perhaps 9m. The leaves are satin, mid-green to dark-green (pale green beneath) and elliptic. Flowers in sprays. Leaves mostly alternate on the twigs. Flowers dish-shaped, with five petals. 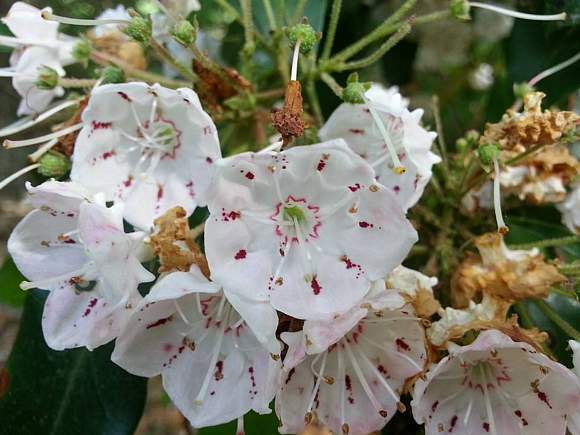 May be pale pink or white, with deeper red markings. Ten long stamens with cream-coloured pollen splayed out towards the edges of the petals. Bog Laurel (Kalmia polifolia), which is more abundant than the other two rather rare Kalmias, but the leaves are mostly opposite (rather than mostly alternate for Mountain-laurel) and has smaller 10-16mm flowers (rather than 20-25mm for Mountain-laurel) and the twigs are 2-edged. Sheep-laurel (Kalmia angustifolia) (which is also rather rarer than Mountain-kalmia), but the leaves are mostly opposite or whorled (rather than mostly alternate for Mountain-laurel) and has still smaller 6-12mm flowers (rather than 20-25mm for Mountain-laurel) and the twigs are round without edges. 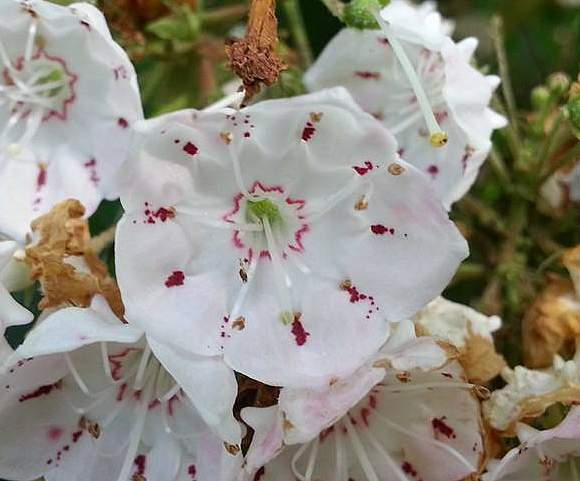 The only other Kalmia found in the UK is the rarer Trailing Azalea (Kalmia procumbens) [R] which has star-shaped flowers, but they are still pinkish. Being an under-shrub it is much shorter at up to 25cm high. It is an introduced species from East and North America and has naturalized in a few wet acid places in the UK (around Portsmouth, which isn't particularly noted for its mountains!). 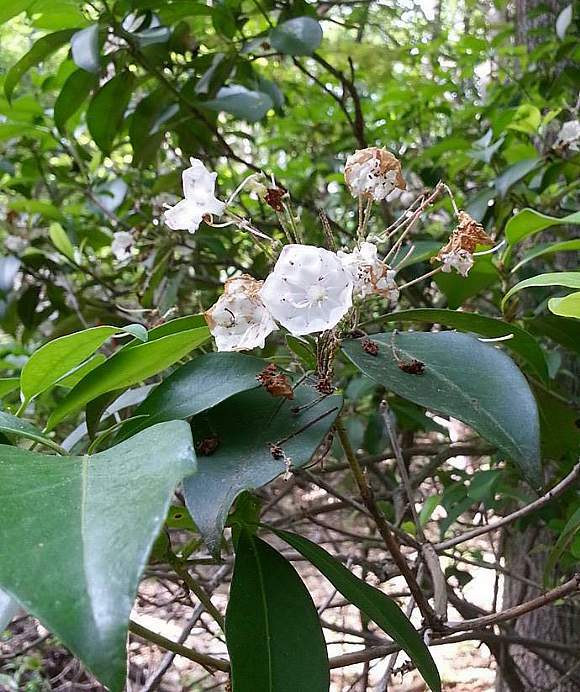 It is toxic containing (in the leaves and berries) Grayanotoxins, mostly Grayanotoxin I (aka Andromedotoxin and Rhodotoxin), plus the glycosylated hydroquinone Arbutin. The acrid principle is AglucosideArbutin. 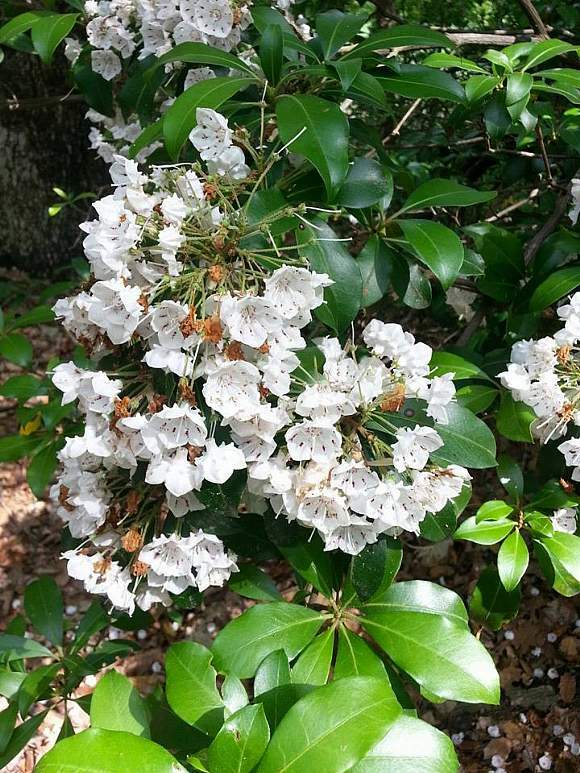 It is poisonous to cattle, goats, deer, horses, monkeys, humans and to sheep (hence the overall Kalmia genus name of Sheep-laurels). The symptoms of poisoning, which start after 30 minutes of ingestion, include irregular breathing, profuse salivation, runny nose and eyes, incoordination, cardiac distress, vomiting, weakness, convulsions, paralysis and coma followed by death. Anorexia and depression may also occur. The flowers are unusual in that the anthers on the stamens are held onto the edge of the corolla (petal) by a little fold in the corolla and only released like springs when an insect touches them, perhaps to knock it temporarily unconscious!